The Sidewalk Explorer web app allows members of the public to view condition and ADA compliance scores for sidewalks, curb ramps, crosswalks, and pedestrian signals. A new effort to create a comprehensive database of sidewalk network features within the Champaign-Urbana area looks at nearly 690 linear miles of sidewalks in the community. Designed to assess and track the condition of the sidewalk network as well as its compliance with the Americans with Disabilities Act (ADA), the Sidewalk Network Inventory and Assessment also highlights potential improvements like closure of sidewalk gaps and replacement of non-compliant sidewalk ramps. The project, executed by the staff of the Champaign Urbana Urbanized Area Transportation Study (CUUATS), found that compliance scores tended to be highest at the periphery of the urbanized area, where the pedestrian network was constructed more recently and after the development of modern accessibility standards; and in the core of the community, where pedestrian network upgrades have been focused. The ring of neighborhoods surrounding the core of the community, many of which contain pedestrian network features that predate ADA, had the lowest levels of compliance. 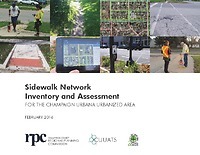 “The Sidewalk Network Inventory and Assessment is a great tool and has been incorporated into the city’s ADA Transition Plan,” said Bill Gray, City of Urbana Public Works director. “It’s the basis for developing a Sidewalk Master Plan, helps in prioritizing sidewalk repair and replacement locations, and has provided a GIS (geographic information system) layer to aid in planning.” The Cities of Champaign and Urbana, the Village of Savoy, the University of Illinois and Illinois Department of Transportation District 5 all collaborated with CUUATS on the project. 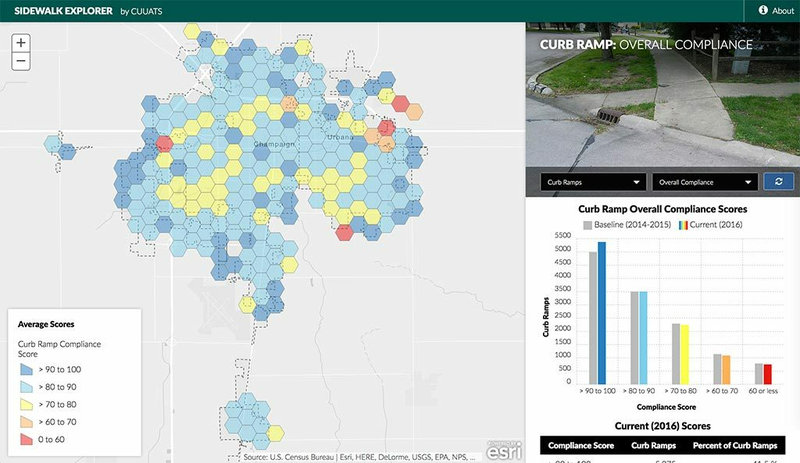 Data collection was accomplished in a cost-effective way through the utilization of interns, who recorded the geolocation of each feature and took photographs of all curb ramps. This data was then compiled into an online geodatabase found at sidewalks.cuuats.org. Updated in 2016, the database will be updated each summer with features constructed or modified during the previous calendar year. The most common condition defects among curb ramps was surface condition. Sidewalks were more likely to score poorly on the frequency of vertical faults or the number of cracked panels. Field staff noted worn or faded painted markings in some crosswalks and a small number of pedestrian signals had nonfunctional pushbuttons. To aid local agencies in prioritizing accessibility improvements, CUUATS staff performed a priority area analysis. It pinpointed five high-priority zones representing areas with the greatest demand for accessible pedestrian infrastructure, including the Downtown and Campustown areas of Champaign and the area around Lincoln Square in Urbana. Details of the priority area analysis, along with a connectivity analysis for sidewalks and curb ramps, appear in the report document, which is available as a downloadable PDF. Based on the findings of the Sidewalk Network Inventory and Assessment, CUUATS staff has developed recommendations related to ADA compliance, condition, connectivity, priority areas, and funding. These recommendations provide very useful steps that local agencies can take to address the study’s key findings and improve the safety and accessibility of the community’s sidewalks. In addition, other Metropolitan Planning Organizations, Departments of Transportation, and Local Planning Authorities can easily adapt the means and methods used to compile data and analyze it.